Last weekend Patriot Solar Group (PSG) made an appearance at the Great Lakes Emergency Preparedness Expo (GLEPE) in Birch Run Michigan. The event focuses on preparing for disaster situations where immediate assistance is not plausible. Exhibitor booths ranged from non-perishable foods to kevlar vests and everything in between. Name plate companies such as Coleman and Bullet Safe were in attendance as well as the U.S. Navy, U.S. Coast Gaurd, and the local police force. PSG’s main exhibit was buzzing with crowds of solar power enthusiasts, many of whom had already begun off-grid solar power systems and were seeking additional capabilities. PSG staff offered information and guidance to interested attendees of the show which lasted from 8:00 a.m. until 4:00 p.m. Outside of PSG’s booth the Micro Charge solar trailer and the Ev1 Electrical Off-Road Vehicle attracted several interested visitors. Both the Coast Gaurd and the Local Police found the electrical vehicle to be an enticing product and a plausible solution for the needs of both branches. At PSG’s main booth visitors could experience hands on interaction with the solar racking products that PSG offers. 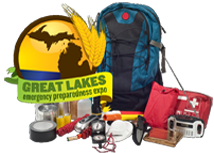 The Great Lakes Emergency Preparedness Expo will return to the Birch Run Expo Center October 4, 2014. The event is free for the public to attend and includes several educational speakers and a vast array of interesting and exciting products.